Gift cards are ideal presents for your family members, friends, staff and customers. There are hundreds of merchants to choose from! CCOP receives attractive commissions to fund capital improvements at both St. Augustine’s and St. Elizabeth’s Campuses. Gift Card purchases may be made from November 14th, 2016 to January 1st, 2017. You can order cards directly on-line at www.shopwithscrip.com. To register, you will need to enter the CCOP ShopWithScrip Enrollment code: 85C4B18426783. Drop off your order form and payment at either St. Elizabeth’s parish office or St. Augustine’s rectory office. You can also use the traditional paper order form (available for download on this page as well or at parish offices). Order cards online and pay using the Presto Pay feature. See the PrestoPay Instructions on the left hand side of this page. Write a check to CCOP, drop off your order form and payment at the parish offices. St. Augustine Parish Office Hours Monday to Friday: 8:00 a.m. to 8:30 p.m.
Sunday: 8:00 a.m.to 2:00 p.m.
Sunday to Thursday: 8:00 a.m. to 8:30 p.m.
For all orders paid for and received by Sunday at 8:00 p.m., gift cards will be available for pick up on Thursday afternoon after 2pm or anytime thereafter at St. Elizabeth Seton Parish Office. If you have any questions, please contact Maggie Go-Yu at mtgoyu@comcast.net or 925.462.2913 or Judy Robichaud at jarobichaud@comcast.net or 925.519.1936. Be a Pizza Angel! AMP Middle School Ministry is requesting Little Caesars gift cards. When you purchase a gift card for AMP, the parish receives 8% back from Little Caesars, and the middle schoolers receive delicious pizzas at our social events. It's a win/win! 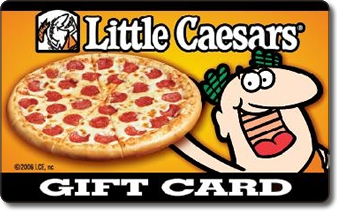 You can also request for your Little Caesars gift card to be delivered directly to the Faith Formation Office. Please use the links above to but your gift cards. Our hungry preteens thank you!